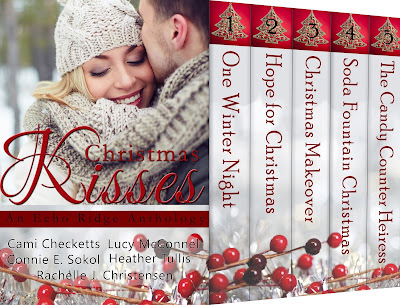 Christmas Kisses- 5 Stories for just $.99! Win amazing books by each of the authors. Enter below to win - nine different books will be given to nine lucky winners. A rock star living a lie. 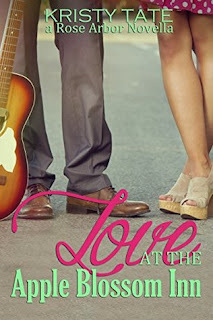 Their paths cross and lead them down a road neither of them expected to find: love at the Apple Blossom Inn. Janey knows that life doesn’t come with a happy-ending guarantee. She needs to keep her feet securely on the ground working two jobs, going to school, and caring for her little brother. She has no time or room for romance. After an accident leaves his charmed life in ruins, Derrick abandons his Hollywood lifestyle and checks into rehab. The world believes that Derrick Cordell the rock star is dead. And despite his beating heart and breathing lungs, that’s exactly how he feels until, disguised and living incognito in the tiny town of Rose Arbor, Washington, he meets Janey, who loves him as plain old Eric Roudell, the wanna-be music teacher. But secrets have a way of unraveling. When Janey discovers the truth about Eric/Derrick, how can she love someone she doesn’t even know? Especially since love is not on her to-do list? This is a novella, over way too fast in my opinion. This is a story that could easily be stretched out a bit and made into a full length novel with more depth and time for growth. I really enjoyed the characters and the setting. Both were believable and real. I could picture the scenes playing out in my head like a movie which is always a great thing. The relationship between Janey and Derrick just happened so fast. It went from a couple interactions, to an afternoon together with her brother to declarations of love after a separation. It was hard to believe in the love there. The other thing that I felt lacked some depth was Janey's relationship with her mother and Derrick's road to recovery. The foundations of this book just weren't there for me. But, having said that, here are some things that I did love. I loved the sense of community in this story. A town that rallies together when tragedy hits always makes for warm fuzzy feelings. As I said before, I loved the B & B setting and the characters. I felt like I had a good handle on personalities by the end of this book. As of today, this novella is FREE on Amazon! If you haven't read anything by Kristy Tate, this is a good opportunity to check out a new author. Pick it up and let me know how you liked it. Content: Some references to alcohol abuse and a wild lifestyle. Some mild innuendo. Holly is beyond excited about her first date with Dave. 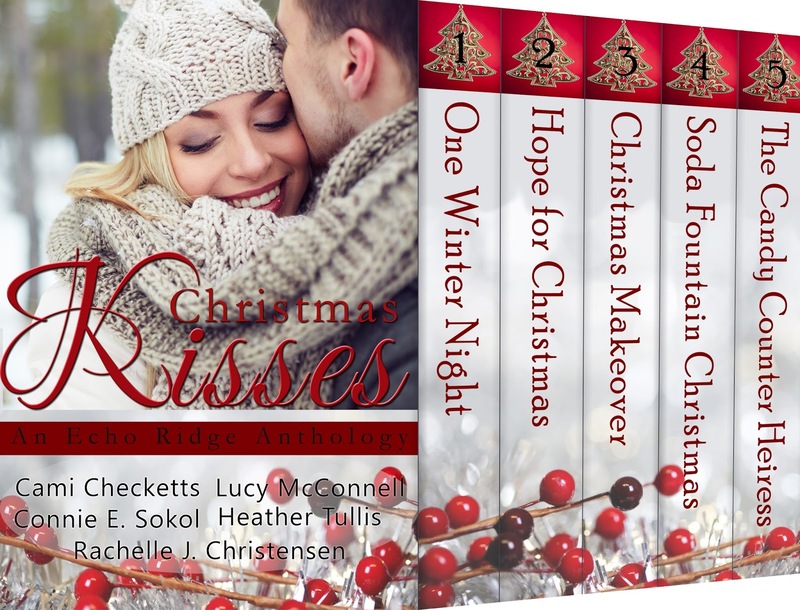 They share a love for her beloved small mountain resort town, plus she’s never felt such sparks for a guy before. 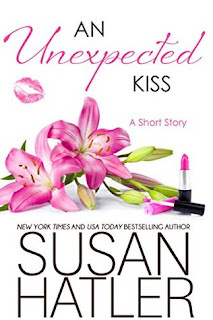 But when her mom warns her to proceed with caution so she won’t get disappointed, Holly pulls back—until an unexpected surprise entices her to risk her heart completely. 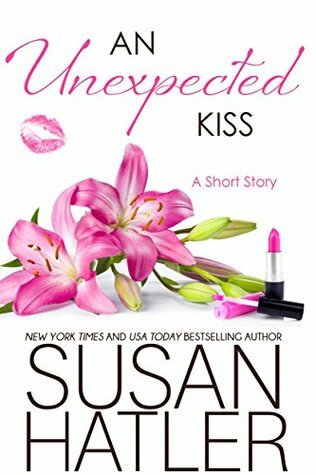 An Unexpected Kiss will take you 20 minutes to read. If that. It's super short and super sweet. I love Susan Hatler. She really has a knack for writing sweet romance and you won't believe what she accomplishes in the 24 pages here. That's right, 24 pages. This book is the beginning of a fantastic relationship between Holly and Dave. It's their first date and you will experience all those anxious thoughts and butterflies in your stomach right along with them. I opened this book on a plane ride to Hawaii. I knew this was a short story but I didn't realize just how short it really was until I reached the end and wanted so much more. Sigh. I really wanted more. Susan Hatler has so many great books and if you haven't read anything by her yet, you really should. She is the queen of short and sweet romance novellas. What would you give to live forever? Seventeen-year-old Elijah Brighton wants to become an ascender—a post-Singularity human/machine hybrid—after all, they’re smarter, more enlightened, more compassionate, and above all, achingly beautiful. But Eli is a legacy human, preserved and cherished for his unaltered genetic code, just like the rainforest he paints. When a fugue state possesses him and creates great art, Eli miraculously lands a sponsor for the creative Olympics. If he could just master the fugue, he could take the gold and win the right to ascend, bringing everything he’s yearned for within reach… including his beautiful ascender patron. But once Eli arrives at the Games, he finds the ascenders are playing games of their own. Everything he knows about the ascenders and the legacies they keep starts to unravel… until he’s running for his life and wondering who he truly is. The Legacy Human is the first in Susan Kaye Quinn’s new young adult science fiction series that explores the intersection of mind, body, and soul in a post-Singularity world… and how technology will challenge us to remember what it means to be human. Susan Quinn is an author that I'm always interested in. Her Mindjack series was amazing and that is where I first fell in love with her writing. I also loved her steampunk fantasy romance series, The Dharian Affairs. Susan has a way of making people and places come alive in her books. The Legacy Human started off really slow for me. I felt like I was sort of stuck in one place and the forward movement inched along while the foundation was set up. Thankfully things began to pick up. Eli is an interesting character. One of the things I love best about him is his fierce determination to save his mother. His love and devotion to her and her well being is one of Eli's most attractive characteristics. Eli is also a bit naive, and I liked that as well. Others around him are far more informed and experienced with dabbling in things illegal and on the down low. Eli is constantly grappling with new ideas and information being thrown at him, trying to catch up with what everyone else already knows. By the last third of the book was I was finally in a place where I felt like I had to keep reading to find out what happened next. I was personally invested in Eli, it just took me a while to get there. I have the next book, The Duality Bridge, and I'm looking forward to starting that here soon. This book leaves off in a place that has me anxious to know what comes next for Eli. Untraceable. She’s already figured out the money’s going toward something illegal. And yet she’s breaking the law, no questions asked, all because it’s what I need and she wants to keep my art. She’s always been generous, always given me exactly what I need, effortlessly and with grace, but this… I don’t have words for this thing she’s doing for me. I don’t believe in angels, but if I did, Lenora would have to qualify. I am so hopelessly lost when it comes to her. What does it mean to be human? Elijah Brighton is the face of the Human Resistance Movement. He’s the Olympic-level painter who refused an offer of immortality from the ascenders—the human/machine hybrids who run the world—in solidarity with the legacy humans who will never get a chance to live forever. Too bad it’s all a complicated web of lies. Worse, Eli’s not even entirely human. Few know about the ascenders’ genetic experiments that left him… different. Fewer know about the unearthly fugue state that creates his transcendent art—as well as a bridge that lets him speak to the dead. But the Resistance is the one place he can hide from the ascender who knows everything the fugue can do. Because if Marcus finds him, he’ll either use Eli for his own nefarious purposes… or destroy him once and for all. The Duality Bridge is the second book in the Singularity series and the sequel to The Legacy Human. This thrilling new young adult science fiction series explores the intersection of mind, body, and soul in a post-Singularity world. Delphina is watching me from outside the holo matrix… along with Kamali, whose wide brown eyes hold silent judgment for the things she thinks I’ve done. Forbidden things, like being a love toy for my ex-patron and current-rebel-ascender, Lenora. Who happens to be standing right next to her. While Kamali’s graceful dancer body is hidden under the black military garb of the resistance, Lenora’s perfect bodyform is barely covered in scintillating ascender-tech fabric. The thing is, I’ve never so much as kissed Lenora. Except in my dreams, which really shouldn’t count against me. Any seventeen-year-old guy would have those kinds of thoughts. But the truth is Kamali’s not wrong to judge me. My feelings for Lenora have always been… complicated. Susan Kaye Quinn is the author of the Singularity Series, the bestselling Mindjack Trilogy, and the Debt Collector serial, as well as other speculative fiction novels and short stories. Her work has appeared in the Synchronic anthology, the Telepath Chronicles, the AI Chronicles, and has been optioned for Virtual Reality by Immersive Entertainment. Former rocket scientist, now she invents mind powers, dabbles in steampunk, and dreams of the Singularity. Mostly she sits around in her PJs in awe that she gets to write full time. It was a robbery gone bad, or so they said. For Detective Trey Shotwell, the murder of his mother, a prominent artist, was the catalyst for setting aside his own artistic aspirations to pursue a career in law enforcement—despite the opposition of his father, also a famous painter. When he agrees to attend an art auction featuring his father's work, the cruise ship locale provides the relaxation that Trey needs—and when he meets stunning fellow passenger Ariah Stanton, the undeniable chemistry they share is an unexpected bonus. The crime is eerily reminiscent of the death of Trey's mother so many years before. But this time, the young detective has the resources he needs to track the killer. As the pieces of the puzzle begin to come together, they paint the chilling picture of a sinister plot years in the making. In a manhunt that takes him from the high seas of the Pacific to the wilderness of Australia, Trey will stop at nothing to solve the crime and protect the woman he loves. Portrait of Lies is suspense just like I like it- just enough to keep you interested and on the edge of your seat but not too scary. Clair Poulsen is one of my favorite authors in the LDS suspense genre. His books are clean and have a great flow to them. I really enjoyed this one! 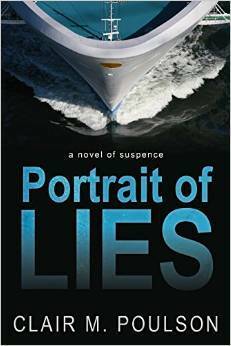 This book is primary set on a cruise ship and revolves around some paintings. There is a whole cast of characters and I suspected them all. Even though there were so many characters in this book I never felt as though I didn't know who was who. I had a clear picture of each character in my head and they all came into the story in a way that was easy to remember. That is always a huge thing in a book like this. Trey is a character that is easy to root for. He is strong yet kind. He knows what he wants and works hard to get it. Ariah is less of a standout in this book, more needy than anything but a good contrast to Trey. This book is an LDS suspense. The characters mention their religion and the book will say they talked about religious things but nothing is detailed or specific. There are some violent things, murders and such things that are usually found in suspense novels. Other than that, this book is squeaky clean- no swearing or sexual content. Squeeeeeeeeee! I cannot tell you how excited I was to get my hands on a review copy of this book. Colleen Houck and the Tiger's Curse series are right at the top of my favorite list and when you see the beginning of a new series coming out by an author you love it's like Christmas day. Yay! I'll admit I did the happy dance for this book. When you love an author and a series so much, it's equal parts excitement and trepidation starting a new series. Will you love it as much? Will it live up to all you are hoping for? There are so many expectations. I'm happy to say that I did really enjoy this book. Was it better than Tiger's Curse? I don't think so, but this is only the beginning of the series and I would expect that by the end, I will probably love it just as much. It is definitely off to a grand start. How would it be to discover a mummy coming back to life? Freaky and creepy, I tell you. That's what it would be. I think Lily would agree. At least at first. Amon will grow on you though. His quest will become your quest and you will have no choice but to be sucked into the world of good vs. evil in Egypt. There is a scary cast of evil characters but an awesome cast of good guys as well. It was so easy to be swept up in this finely crafted story. 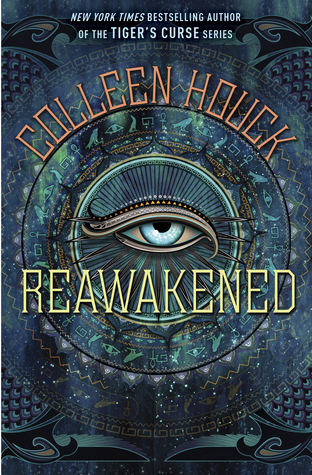 And of course, true to Colleen Houck form, the ending leaves you pulling your hair out in frustration knowing you have to wait at least a year for the next installment. So, this was an action packed, pushing you forward kind of book. I could barely catch my breath. It was awesome because I love being sucked into a book, not wanting to put it down because I just have to know what is going to happen next. How will they get out of this mess? My mind was filled with all sorts of magical and mystical things. And best of all? It was clean. No swearing or sexual content to make me squirm. My thanks to the publisher, Delacorte Press, for allowing me to read and review this book. I sure feel like a lucky girl. Reawakened releases on August 11th! Meet the people who make it all happen—the planners, the photographers, the musicians who have helped orchestrate the perfect day for countless couples—as they find their own happy endings in the second Year of Weddings novella collection. MacKenzie “Mac” Davis left her hometown of Red Leaf, Wisconsin, to pursue a degree in journalism. But when her dad, the town’s beloved Coach Davis, suffers a mild heart attack, Mac returns home to help out. She takes a job at the weekly newspaper but instead of covering serious topics, her editor wants her to write about social events—like the garden club’s flower show and the historical society’s afternoon tea. Mac knows it’s no way to earn her father’s respect—or the attention of one of the newspapers she hopes will hire her when she leaves Red Leaf. When Hollis Channing, Mac’s high school nemesis, returns to Red Leaf to marry her celebrity fiancé, the editor asks Mac to cover the big event—and all the festivities leading up to—for the newspaper. The last thing Mac wants to do is reconnect with the person who made her life miserable when she was a teenager . . . unless it’s spending time with Ethan Channing, the bride’s older brother—and Mac’s first crush. Mac is no longer the awkward girl who wore the school mascot costume to the Homecoming dance but she realizes something hasn’t changed. Her feelings for Ethan. 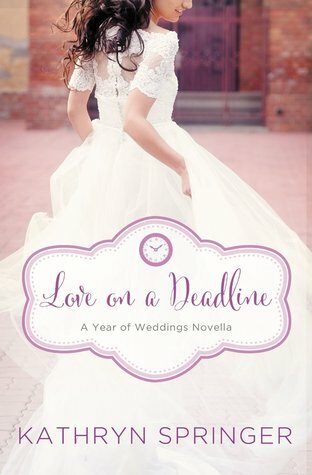 This book is part of the Year of Weddings Novella Collection. I picked it up on NetGalley because I've always enjoyed reading these kind of books. Each month a new novella is released based on a common theme. This series involves people who make weddings happen- the planners, photographers, musicians etc.. These books are stand alone and do not depend on any of the others. MacKenzie was such an easy character to like. I loved her sense of loyalty and devotion to her dad. She leaves the life she has created post college and the future she had planned to move home and watch over her dad. It's not necessarily what she wanted but she is determined to make the best of it. She takes on the less than stellar job at the local newspaper but longs for more. MacKenzie really wants to make it big in the world of journalism. For me, Mackenzie stole the show but the other characters in this book brought depth and color. I really liked Ethan and his devotion to his family. He works hard to stand by them and make them happy. He is an easy going guy and he is very interested in MacKenzie- all grown up and looking good. I really liked the idea that people can change and you should be careful about judging situations and people by only what you can see. Chances are if you really knew them, and their story, you would feel differently. Mac learns this throughout the book and it was very satisfying. Overall, a great book and I really enjoyed reading it. It is clean- no swearing or sexual situations. Light Christian Fiction. 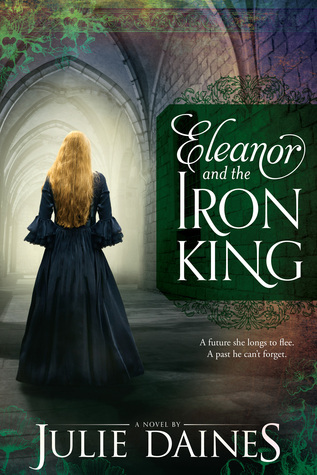 Eleanor de Lacy is forced into an arranged marriage with her father’s greatest enemy, Brac Goch, the Welsh king. All Eleanor knows of Brac is that he is a ruthless, war hungry man. Eleanor arrives at the Welsh castle of Bryn Du already expecting the worst. When the ghost of Brac Goch’s first wife appears and warns her that the Welsh king is not to be trusted, all of Eleanor’s fears are confirmed. As the countdown to her wedding day approaches, Eleanor must figure out who is lying, who is telling the truth, who is loyal, and who is the traitor--and most of all, if she can love an enemy king. This book held a few surprises for me as far as genre goes. I was expecting a historical fiction with some romance but I also got a bit of the dark magic, haunting ghost thing as well which added some flavor to the story. Eleanor is an interesting character. She has spent a lifetime being abused by her father which makes her distrustful and wary of others. But, for some reason, she believes what her father tells her about everything. Which is just crazy. Why would you believe the person who hurts you the most? Eleanor expects the worst from Brac Goch. He is the enemy. Even though he is nothing but kind to her. She has grown up believing he is the worst of the worst though and when the ghost of Brac's first wife shows up with creepy messages in blood, Eleanor can't ignore them. Eleanor is torn by what she believes and what she sees. It makes for a bit of suspense and intrigue and it kept me wanting to read the whole book through. I was caught up in the story and I was equally frustrated by and proud of Eleanor. The pacing of the story was really good; the characters flawed but believable. I really enjoyed this book! Content: Clean. No swearing or sexual content. There is dark magic and some violent scenes in regards to that. If there’s one thing that Bridgette Reynolds has learned recently, it’s that the perfect shoes, the perfect hair, and the perfect dress do not make for the perfect proposal. In fact, sometimes they make for the not-so-perfect breakup. Now, Bridgette must do everything in her power to win Adam back. She knows they are meant to be. And nothing will stand in her way—not her friends, not her grandmother, not even the fact that Adam is now engaged to Serene after a whirlwind romance. Focused on her plan to win Adam back, Bridgette isn’t expecting Ian—her college best friend, her love, her big regret—to come back into her life. They sink back into their comfortable friendship as if no time has passed at all, making Bridgette start to question her feelings for Adam. But Ian has a few secrets of his own . . . secrets that could shatter their friendship once and for all. Bridgette has to make some major decisions—should she speak now? Or forever hold her peace? “Bridgette?” I hear a male voice say my name as I near the staging door. An extremely familiar voice. I turn around. “Yes?” I ask, searching through the crowd for the person who’s calling my name. Thinking it couldn’t possibly be him. Not after all this time. “Bridgette Reynolds?” The voice gets closer. A face comes into focus. My blood starts pumping through my veins at a ridiculous pace. “Ian?” I say, my eyes bugging out of my head and my stomach twisting into knots instantly. “Ian Davies?” It can’t possibly be him. But, on closer inspection, it is him. I swallow hard to push back tears that are already on the surface because of Adam. But seeing Ian after all this time pushes those tears to the very edge. “Bridgette? Oh wow.” He wraps his arms around me, lifting me up and spinning me long enough for me to gather my tears and force them back. “What are you doing here?” he asks, as he puts me down, gesturing to the catering uniform I’m wearing, which, thank goodness, is a black skirt and a white dress shirt, paired with lovely black no-slip shoes. And by lovely, I mean they are hideous. I can handle this ensemble, though. There are other, much-less-attractive uniforms I’ve had to wear. “I work for the catering company. What are you doing here?” I gesture to his black suit, white shirt, and black tie. Armani, no doubt. “I work for the brokerage.” He nods his head toward the party going on behind him. “I can’t believe I’m seeing you. Here, in New York. What’re you doing here? Do you live in the city?” Ian asks. This is all incredibly hard for me to wrap my brain around. I had honestly given up hope that I would ever see or hear from Ian again. Of course, I had envisioned running into him—many, many times—but it wasn’t like this. Most of the time, I was in a tight dress, wind in my hair . . . not at a party I’m working, in a not-so-flattering uniform, smelling of onion. By day, Becky Monson is a mother to three young children, and a wife. By night, she escapes with reading books and writing. In her debut novel, Becky uses humor and true-life experiences to bring her characters to life. She loves all things chick-lit (movies, books, etc. ), and wishes she had a British accent. She has recently given up Diet Coke for the fiftieth time and is hopeful this time will last... but it probably won't.